The CRF450R is the absolute hole shot; delivering a motocross riding experience like no other. Converting the "Absolute Holeshot" into moto wins requires more than just added performance, so the 2019 CRF450R has a host of updates around rider comfort as well offering a machine that is lighter and more powerful. The CRF450R receives a number of important updates for 2019. Better engine performance is achieved through a new combustion-chamber shape, as well as improved over-rev characteristics through a refined oil-management system. 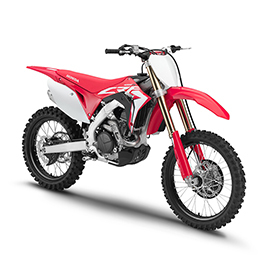 The CRF450R offers class-leading power and handling backed by the kind of quality only Honda provides. The frame and swingarm have been revised for optimized rigidity and weight reduction, while the braking system has been updated with a lightweight front brake calliper featuring a large-piston design. 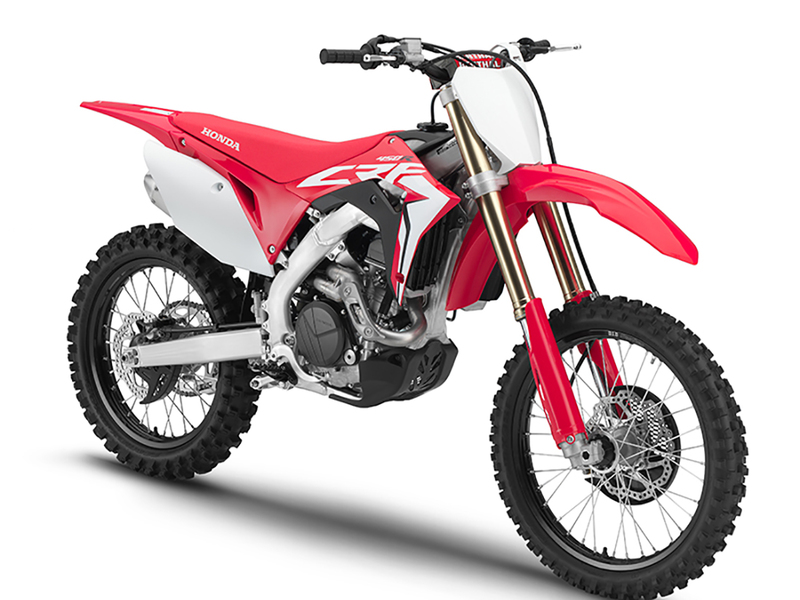 As a result of the weight-saving measures, the CRF450R is lighter than its predecessor. For added performance and increased comfort, the 2019 model features new ECU settings, HRC launch control, a Renthal Fatbar® handlebar and adjustable handlebar position. Black rims and redesigned fork protectors are also new. All-new piston oil jet uses five nozzle holes and a refined pattern to improve cooling efficiency and reduce knocking, enabling a precise ignition-timing setting for optimum power delivery. Shift sensor adopted to establish an ignition map for each gear, enabling optimum running. Utilizing the space gained by eliminating the kick starter, a new exhaust features a larger pipe diameter and optimized design at the branching location for increased power. Previously 31.8mm, the right and left pipes are now 35mm and 43mm, respectively. In addition, total tube length (from exhaust port to muffler end) is up 98mm on the right and 187mm on the left.